The Deck is the ultimate luxurious family holiday house, a fabulous, elevated contemporary beach front property with great views and stylish modern appointments including leather lounges, flat screen TV, CD and DVD players. The Deck sleeps 8 in 4 bedrooms [2 queen, 4 singles], a walk in robe and ensuite bathroom to the master suite and a second spacious family bathroom. All the other bedrooms have built in robes and there is a fully equipped laundry. The family/dining/kitchen has fantastic views of Island Beach. The brand new kitchen is extremely well appointed with a large island bench, walk-in pantry, Miele dishwasher, microwave. The huge entertaining deck with roasting barbecue, seating for 8 plus relaxing bench seats overlooking the aqua waters is perfect for entertaining and relaxing. Island beach is a 5 km long, beautiful white sandy swimming beach. The area is well known for great fishing. The Deck has a mooring available for those with their own boat and dinghy. We haven't forgotten your little ones and provide beach toys, games, DVDs. The Deck is a self contained holiday house fully equipped to make your stay hassle free. We supply many basic commodities plus coffee maker, plunger, dripolator. We also offer linen [sheets and bath towels] as an optional extra [$30 per person for your whole stay]. In addition, all bedrooms have fans, electric blankets, doonas, cotton blankets and wool blankets. 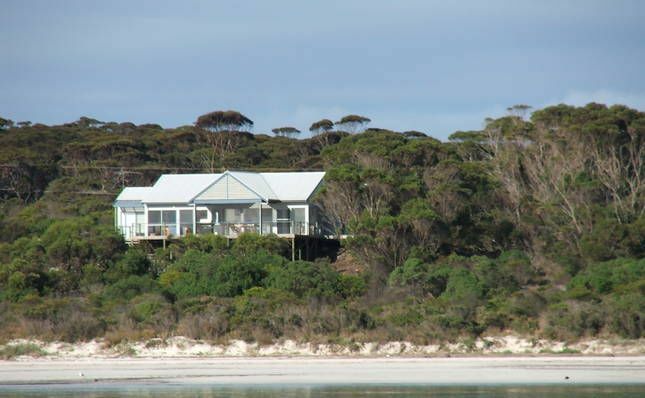 The property has absolute beachfrontage and is situated amongst the trees with fantastic views of the beach and Eastern Cove. It is situated 14kms from Penneshaw [15mins from ferry terminal] between Penneshaw and American River. It is in the heart of the Eastern end of KI with great fishing, beautiful beaches, good food and wine, wildlife and a number of highly skilled local artisans. The island abounds with wildlife. Wallabies live in the bushes near the house. Blue wrens dart amongs the bushes under the deck. Pigmy possums, echidnas and penguins also live in the area. Feed the pelicans on the beach in front of the house. For those who like good food and wine, visit sunset winery and Dudley Winery just out of Penneshaw for good local wines, prawns and local fare. A short drive away you can climb Prospect Hill and take in fantastic views from the south to the north coast, visit Pennington Bay and take in the incredible vista and walk the wild long surf beach on the southern ocean. Then on to American River to buy fresh oysters at the wharf and relax with a cup of coffee or light lunch overlooking the inlet. On the first Sunday of every month and also when cruise ships are in port, there is a lovely small market in Penneshaw.